It’s been one year that we’ve been in the RV. I’m glad that I moved into an RV, because I’ve seen so many states and capitals! They are all different. We recently went to Washington DC. It took seven hours to drive there from where we are staying (MA). We stayed in a hotel. It was exciting! There were so many things to do. We got to go the White House! It was really pretty. There was a red room, a blue room and a green room. I loved the red room best! Not many people can go to the White House. We were lucky! Then we went to the Capitol Building. We got get a tour from Joshua (who worked in the office of our Representative). It was really cool. Some high school people drew pictures that were hung in the tunnels. Some were really pretty. Some were from Florida, some from Delaware, and some were for other states. The students were representing their states, where they lived. The smaller the state, the less paintings there were. It’s kind of like the what the Representatives do. They all have their own drawings and their own opinion about what’s important for their state. There were other paintings that were older. One was of George Washington with a lot of girls. It was up on the ceiling. George Washington is my favorite president, so I liked this a lot. I liked the background, too, with the clouds and everything. We are related to someone who signed the Declaration of Independence, Roger Sherman. He was up on two big pictures (he’s the one in the middle of the five in the foreground, in front of the desk). They had a sign with numbers that showed who the people were that signed the Declaration of Independence, so I could see what he looked like, because I actually never saw what he looked like before. I’m glad I got to see the picture of him! The capitol buildings of the states looked very similar. When we were going to Mystic Seaport yesterday, we saw the one in Providence, RI. I just saw it from the car. When it was dark it had blue lights. It was very pretty. 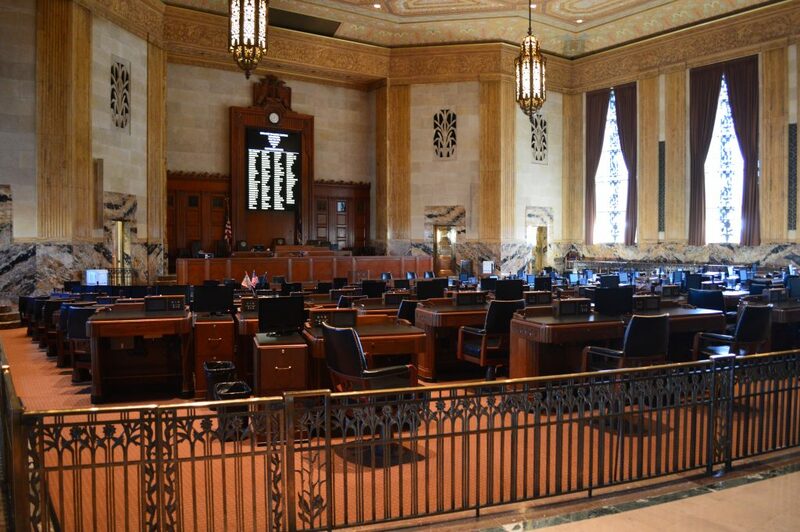 We’ve been in other capitol buildings like in Baton Rouge, LA. I remember a lot of paintings and people there. There were rooms where people had meetings where they talked about important stuff. The representatives and senators were in separate places in the building. They had their own opinions. I like all the capitol buildings! They are all different on the inside. They have their own stuff that’s cool, like their own paintings and statues. 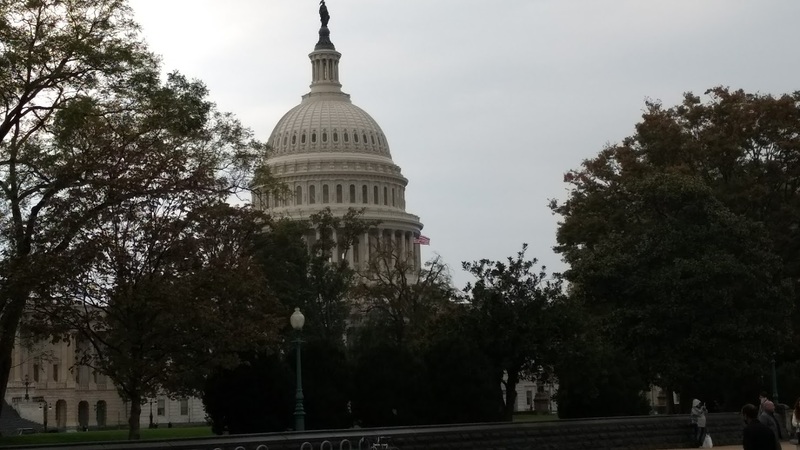 I like going from state to state to see the capitol buildings. I’ve only seen a few, but I hope to go to more this year! 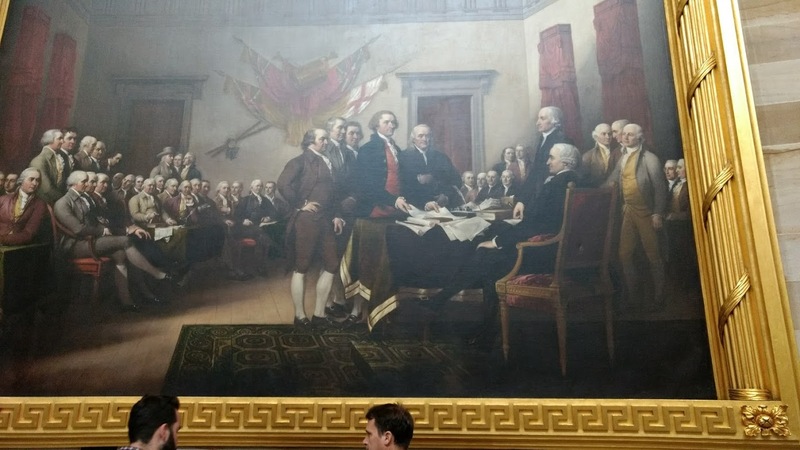 I’m glad to see these new photos from your trip to Washington D C. How neat to see the picture of Roger Sherman, who signed The Declaration of Independence. 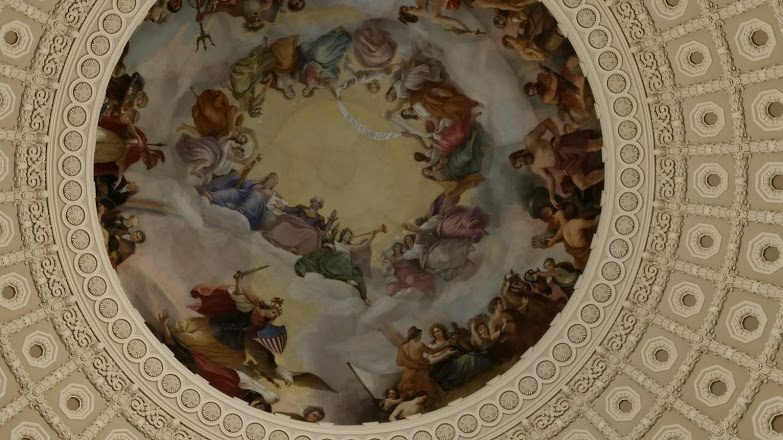 Maybe someday I’ll get to see that old painting of George Washington on the ceiling.